Hot off the heels of hosting and participating in #LOWREZJAM, I decided to pile more pressure on myself and enter #JS13K. I wasn't overly pleased with my entry to #LOWREZJAM, because mid-way into the jam my PC decided to have several meltdowns, killing my HDD and GPU. So with a feeling of something to prove, mainly to myself, a fresh start with Linux and a greater jam challenge than the usual I decided this game had to be something interesting. I asked my friend ai Doge if he wanted to enter with me, and he agreed. It was his idea to make a tower-defence style game, and this quickly evolved into the towers actually being satellites, orbiting planets, orbiting a star. On paper it seemed simple, so rather little design went into it from the start and instead things were decided based on how it all fitted together in practice. So sorry if this post-mortem focuses entirely on technical challenges, just the design process was organic and, really, I should have written it up while it was happening. I guess that's just another take-away from this experience! We used only basic Canvas features, it was a personal challenge to try and support IE as well, so not even all of them! One challenge that presented itself was with drawing "orbit" lines. For whatever reason, drawing large shapes like lines, but particularly curves, is INCREDIBLY slow. The solution to this was to cache each orbit line on another canvas(es), while this did actually render faster, it used up a lot of memory for what is essentially empty space. The next step was to minimize the number of canvases, and their size. This was simpler that expected. Firstly, all orbit lines (at least groups of them, if they share the same target/center) can be drawn onto the same cache canvas, the only requirement being that the cache canvas fits the largest orbit line. Secondly, all our orbits are "perfect", they can all be represented by circles with a single center point. This means they're also symetrical, both vertically and horizontally. So the next step was only drawing one corner of the orbit line. This meant the cache canvas could be 1/4 of the size of the actual orbit. All that was required for the "illusion" was to draw the cache canvas 4 times at 90 degree angles. Contrary to the orbit lines though, which are rather large and visible, we also have a lot of lasers represented by lots of tiny drawn lines. However, HUNDREDS of tiny lines were barely noticed when profiling (in Chrome) compared to a handfull of large lines being really slow. I don't claim to know exactly what's going on here. But it's clear fillrate is far more consquential than the number of calls to drawing. This is contrary to a lot of resources I've read on line. Maybe it's not universally true, but I'm glad it's something I've found and can keep in mind for the next time I'm doing something like this. We also used the Speech Synthesis API in our game. Now I wish this was something with an ounce of predictability. On first testing it in Chrome, I tweaked it to a nice robitic sound. However, putting the same thing in another browser can yeild VASTLY different results. In terms of accent being far from your language hinting, and some settings not actually being able to be pushed as far such as pitch and speed. This led me to mostly stripping it back to barely any tweaking and just pointing out on the main game screen that quality will vary! A cop-out, but I found this one area where it seemed pointless to impossible to work as desired. Something I had much better luck with was the Music and SFX. I chose to use the SoundBox tool and player library because it looked like a tool other people I know might be able to make sense of! I have a friend, Francis Fonye, who managed to make some original music for the game at rather short notice near the end. But, while SoundBox is primarily a music tracker, I managed to get some SFX out of it myself. The main one of these was the laser SFX. SoundBox exports as JS code, so the laser SFX is actually a single sound. What I do in the game is generate many more slightly varying sounds simply by changing the note of the exported code. I made enough of these varying notes that I didn't even have to handle the creation of multiple instances of the same sound. I saw this as a double benefit! We can wrap the thing in an IIFE (our closure) and only export what we need. This is obviously a small example, the usefulness increases with the number of things your system needs that aren't actually required outside of it. // Using string. BuildTower(x, y, "laser"); // What our code says. g(x,y,"laser"); // What CC might put out. // Using enum (as seen above). BuildTower(x, y, TYPE.LASER); // What our code says. g(x,y,0); // What CC might put out. Again, small example, but the more this practice it used the more space is saved! Last time I wrote about creating a stand-alone web app to create heightmaps. This has come along somewhat, though I keep thinking of features to add that could help the voxel engine, as well as other applications. So far it can create a new heightmap by blending any number of given heightmaps together, and the resulting data is used to also generate a colored "terrain" map. As you can see, it's pretty neat, but there's so much more infomation we could do with. Such as shadows, both stand-alone and imposed on the terrain map. Also a normal map would be helpful for some applications. And maybe just some random details so the terrain can be used as a texture. These shouldn't be too difficult to add. It's mostly the interface that needs work, and some more detailed functionality like selecting the blend modes. 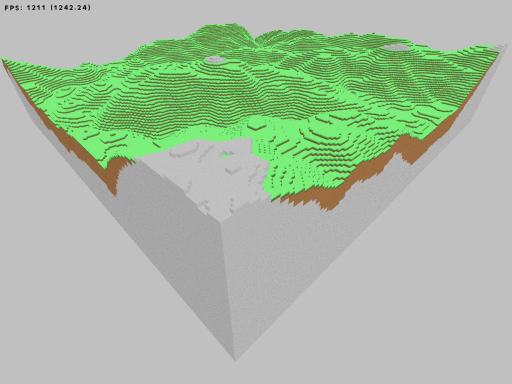 My HTML5 voxel engine has so far been built up around the idea of handling terrains, specifically that from a heightmap. While this won't always be the case, it's a good place to start. There's no end to interesting heightmaps you can find for testing with a quick look on Google Images. 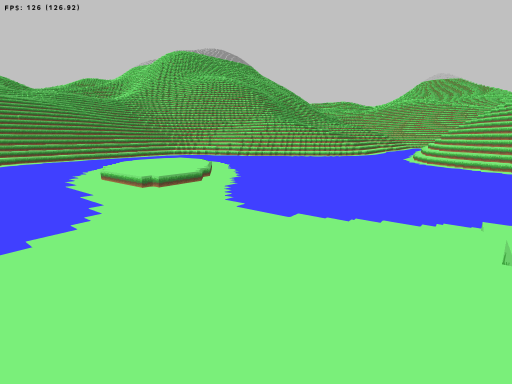 In my engine, a Heightmap is a class object. This object is designed to handle everything you might want to do with a heightmap, before doing anything with it such as passing it to the world to generate. There's not many options to use just yet, but I will touch more on it in the future. OK, so I'm going to leave it at that. It's brief so I put Part 1 in the title. This part of the engine works independently, so my goal is to release this as a stand alone thing purely for generating heightmaps in various ways. Surprisingly, a quick look on Google didn't turn up anything that "just did it", so this could be useful as an online tool. I felt by now that this was actually a very viable thing. To be honest I didn't have high expectations or expect wonders. I thought this couldn't compete with my game Terrablox for speed or memory effeciency, as that was made for windows. But every new thing I was learning kept convincing me otherwise. I started to tidy up my code, as I was expecting to be spending a lot more time on this. I split things up into sensible classes and started adding userbilty features like moving the camera around. I moved on to implementing textures. After some confusion due to WebGL using "upside down" UV coordinates compared to what I'm used to, I finally got it working. I also added a sky coloured background and some fog to blend it all in. And it was really starting to look quite good! I finally got around to culling. It was starting to effect memory quite a lot the bigger maps I put in, having to render so many cubes. The culling process was slow, but it greatly improved the speed at which the meshing was done and also brought the memory usage down. Because the culling was so slow, and it was all done at the start of the program, I decided to put that into a web worker as well. While this meant I didn't have to wait for the culling for the rest of the program to run, it was actually now taking more time to do. I found out this was because I was using JS objects for everything down to the voxels, and that amount of data having to be copied and sent back and forth was choking it. So I had to start using ArrayBuffers, less flexible, but they have the ability to "transfer" between threads rather than being copied. This meant I could completely remove that overhead. Many tweaks down the line, and I had managed to get huge maps of tens-of-millions of voxels fully generating in less than a second. Even though I done it, I still didn't think it was possible... In a web browser! So I plan to trudge along and see just how far I can take this thing. Having made loads of voxel engines over more than 7 years, I plan to release this one as an open source project rather than leaving it to go nowhere in my back catalog. Been a while since I spoke of writing a game engine in JS. The problem with writing "just an engine" is that you can't really know what it needs. So that never really got far, however it was good practice. And recently I was able to put that practice to use by finishing my first game written in JS (it's worth noting that I also didn't use any libaries). The game I made was for the #1BitClickerJam and was called Orchard. It's a clicker/idle game about growing a tree and trying to accumulate as many life points as possible to max out all the upgrades. It was received really well, one of my more popular games despite it being relatively low effort. It placed 9th in the jam, out of 160 total entries, however it was only 1 of 3 games in the top 10 to have over 10 ratings, having 14. Go check it out on itch.io! This project is influenced quite a bit by the Love2D project. I follow the same base structure of the user overwriting 3 main functions, these are; load(), update(dt) and draw(). The player creates these 3 functions and the engine loops through them automatically. The object system is more inline with that of GameMaker, where you create an object and it has a set group of variables that are used to automatically update the object "behind the scenes", such as; gravity, movement, physics and animation. Though on top of that, you can create normal "stripped" JS objects and put them into the system manually for more detailed control. As you can see in the image, nothing is quite settled yet! I think most things will function like the GAME.textDraw() function does and accept all arguments as a JS object. I find this approach very neat and flexible; using one function and only filling in the bits I need. The alternative is the GAME.primitiveRectangle() function here, this can actually be assigned to a variable, but in this case I just want to draw it directly so it calls the method right after the rectangle is defined. But all it's parameters are fixed, and so it's not very flexible. I have been planning to rewrite my website for a long time, now I've finally got around to it. Previously I was using WordPress, but became frustrated at trying to do even the simplest things and not really having control. This new site I wrote from scratch, following a similar design but with everything a little more compact and clearer, not to mention faster and more convenient. I got a couple more websites that I need to update, and they'll likely follow the same design as this. Part of the challenge I set myself with Terrablox is to create it in pure GML, not known for it's speed as it's a high-level language, so no external files that could do the job easier or faster or anything like that. The point of this is that I believe if some piece of code is slow, it's your fault. And finding a way round it by using another tool that is inherently faster is not solving the problem, I think. So it's largely a practice challenge I guess! On that note, there's two main things that are "slow" in Terrablox, meaning in this case they take a lot of processing time, and they are world generation and geometry modelling. These are also the two most important things to the game, so finding ways to make them faster is always ideal. Today I implemented a solution to make the world generation faster. 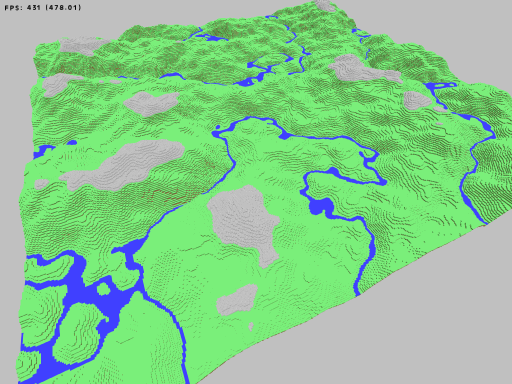 The world generation is done using a noise function, passed different parameters for different levels of detail on the terrain (oceans/continents, mountains/rivers, hills/holes) and then the results are combined to create the final terrain at any given point. While noise functions are generally slow when used a lot, it itself was not the issue. The fact that I was using it a lot was the issue. For each 16x16 chunk it was doing the 3 noise functions for each and every cell, this adds up to 768 noise function calls per chunk and took about 12000 microseconds on average to complete. That's 0.012 of a second, which at 60fps is about 75% of what happens in a second, which is a lot for a single aspect of the game!. What I have been doing to alleviate that demand is split the chunk generation over n number of game steps, which divides the demand n times leaving more spare time in a second which helps maintain a good framerate (at the cost of it taking longer for chunks to appear). It worked ok-ish, and I'll still maintain that optimization. But my new solution is better and simpler and, sadly, blindingly obvious. So, these noise functions work on quite a large scale, to the point there's very little variation in height within a single chunk. So I wondered why the hell am I calling noise functions for every single cell? Surely just calling the noise functions for each corner, and just interpolating those values per cell would be better? And yeah, it is, there's no major visible difference to the terrain in game and it's only costing 8000 microseconds per chunk now. That's good, it's 33% faster. So now it's only doing 12 noise function calls per chunk (3 for each corner). But there are still some noise functions in there to deal with biomes, and other things taking up time, which I shall work on replacing in the same way. I'll talk more about that when I do an article on my method towards biomes. The lerp method can actually be optimized further. As the cells are scanned using 2 for loops, one for x and one for y, we can get the r1 and r2 variables in the x loop before entering the y loop. Which means that we can reduce the lerp function calls from 2304 (16x16x9) down to 864 (16x6 + 16x16x3). So, the processing to lower the drawing is costing A LOT more than the drawing ever did. I did have ideas for optimizing the culling; like only drawing from the current chunk and moving to it's neighbors, using culling to check if the loop should continue. And I think I can get it a little faster by pre-defining a lot of things that I input to the culling function that don't actually change, like chunk position. But even then, the difference between these numbers doesn't bode too well. I think the usual way to solve this problem is with octrees. While I know how they work I've never had the opportunity to implement them in anything before. But basically the idea is to look at groups of chunks contained in bigger boxes, if the bigger box is totally in view then we know all contained chunks are visible and we don't need to check them individually. If a group box is only partially in view then we know some of the contained chunks may be visible and we check them. And we can have boxes inside boxes to make even broader checks. I don't think implementing this will take long, but I hope for a good result when it is! Eww! What is that?! OK, I know it isn't pretty... I didn't spend time prettying it up. But this is the engine running in colored block mode, as opposed to textured block mode. This is designed to create worlds like in the game; Cube World. Now, you could have achieved this with textures, and the cool gradient color thing spread over the world that Cube World does could also be applied to textures. So, why bother doing this? Well, it's also handy for saving memory. For a texture to be applied to a vertex it needs to have 2 floating-point numbers, whereas a colored only block doesn't need them at all! For comparison; the world you see above (around 33m voxel spaces) when textured takes up 220,000K memory, and when it's NOT textured it only takes 170K. Now those numbers represent the whole program's memory usage, which means that 50,000K was used to hold texture coordinates alone! That's nearly 25%. And at the moment, the world isn't that complex, when we start adding trees, caves and things like that, that difference becomes exponential. So it's safe to say, that a color only world has more leg-room for sheer size. And that's why it's a mode worth having. Switching between these modes is currently being done via constants. This is because GameMaker: Studio now has a cool little feature where the compiler checks against constants and won't compile anything from the following block if that constant isn't flagged. You could have 100 if statements checking against constants and it'd have no effect on performance in the final build if none of the constants were true as that code wouldn't be there at all! Nifty. This does however mean you can't switch mode mid-game, but I don't consider that an issue, as you'd make a game one way or the other. Though if you did want it for some reason, you can simply go through and replace that constant with a variable, however you will lose the optimization. Another thing I worked on is progressive generation. I already had done this for modelling. What I mean by progressive is that a chunk's data or mesh can be created over several steps, which will help the engine maintain a playable frame rate. It's helpful for big worlds and testing as now I don't need to wait for generation to finish before it runs. I just run it and the world builds, still needs optimization though. So to show the sort of scales we can work with now I threw together a world with height set to the current max (128). So the mountains are a little grander, though I also decreased the frequency of the noise generation so they weren't all pointy! So this world has over 134,000,000 voxel spaces, and the reason the fps is low here, at 126-ish, is because each chunk is only 16 x 16 x 128, so there's a lot of them for the renderer to iterate through and none of them are even culled! This is an area that'll need a lot of work. Though a quick fix would be to just have bigger chunks. In fact, the new system actually allows us to join chunks together; so if you generate a bunch of them and they are frequently in view, we can join them up to cut down the number of rendered instances. In theory, we also shouldn't need to break up the chunks even if we're editing them. I'll talk more about how that will be done in another post. I'm also now basing the generation on some fixed values, such as height of the sea floor, height of sea level and top height of the terrain. Those are just raw numbers. I'll need to alter what goes into the noise generation so the world scales up evenly and in a way that won't mess up biomes that should always remain the same, like swamps and stuff, which should always be patchy lowlands even if they're next to massive scaled up mountains. As you can see, it's pretty neat! I also didn't expect that cool little island cluster in the corner, but I'll take it! (Over 33,000,000 voxel space, for those interested in progressive numbers, in this case it's about half a kilometer squared.) FPS is lower because there's over a 1000 chunks being drawn. It'd be nice to add height below the rivers, in order to make them actually flow downhill. The problem with this would be finding the beginning or the end of a river as they are purely generated from noise. One way around it would be to just cut rivers off when they reach a certain height, then they'd flow from the sides of mountains. But this wouldn't work in all cases, as when no part of a river would reach that height, you'd have rivers that span over hills and stuff. However, that could also be fixed post-generation, when the water starts flowing it'd know it's flowing in 2 opposite directions, at that point we could bung some rocks in there and make it look like a spring. Another idea I've had for liquids is having them completely separate from from the world's set of voxels. Which makes a bit of sense, really, but they would need to have their mesh created in a separate pass, which also might not be a bad thing. But having liquids separate from the solid world would mean we could have a whole different set of rules for it. I've been toying with the idea of having "bodies" of water, so all voxels that form a stable lake would only have 1 volume value between them... And when one voxel has to flow to another space, it actually only detracts a fraction of volume from the much larger body. Not to mention what the hell I do with an ocean! Anyway, this is all theory, but I thought it might be interesting. So as a break from ignoring Terrablox I've decided to write it again from the ground up. This is my usual way of implementing real changes. Every version I've ever written has had vast improvements, but it quickly becomes dead weight again as I learn more. But this time, I'm coming at it with a different intention; I'm going to make just a core engine and release the source (which, at least for learning purposes and contributions, will be free). Later on, I will get back to the GAME side of it, using this new engine. So that's the goal. As this is an engine, foremost, it'll have features that people have wanted and generally expect in this kind of system. So, procedural generation is a key feature. Onto this, a loose chunk system; chunks are simply stand alone objects, so they can be placed anywhere and in any configuration and will keep the terrain seamless if you fill in the gaps later. Memory is something I've already brought down using buffers with 8 bits per value, rather than GM's ds_grids which are 64 bits per value. I plan to take memory usage further down by using RLE (Run-Length Encoding), as I've so far had no need to access every voxel thanks to my new mesh building system. When building a mesh, previous Terrablox done it in layers, I always knew stacks/columns would be faster and now I'm doing it that way. The thing with columns is you can quickly find where the first visible block is going to be (I track the population of each stack) and start the scan from there, continuing to the point where the last visible block will be. So, at least on a featureless terrain thus far, it's super fast to build the mesh as it reads the minimal number of voxels. And with RLE, even with complex features, it will be able to skip over the gaps, and when comparing to adjacent columns knowing exactly where everything actually visible starts and ends. So the previous Terrablox, at my last reckoning could hold around 20,000,000 voxels in memory I think, before it hit the GM limit of about 1.7GB, it could render more but it'd just be a wrap of the world. This engine so far, without RLE, the most "physical space" I''ve had is 170,000,000 voxels (and there was plenty of room left). It took a while at the start to generate but once it had it built the meshes 1 chunk at a time at 100+fps, while drawing them all, I think since then I've optimized it further. 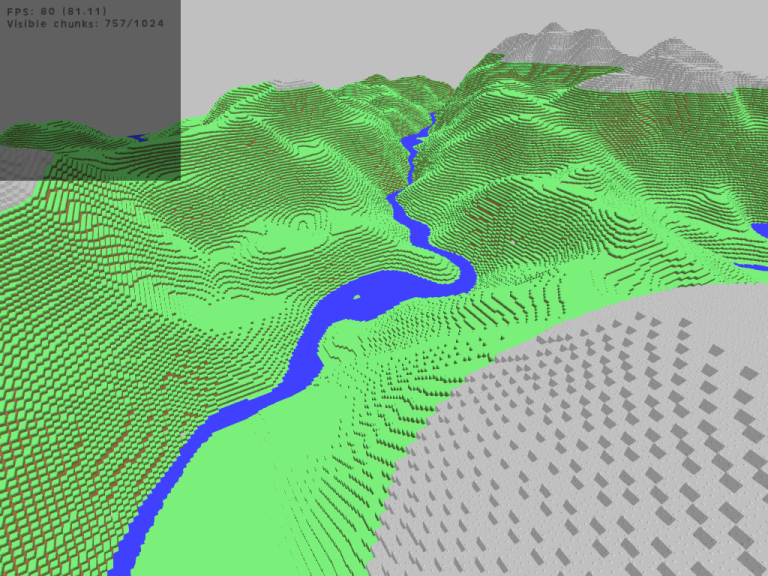 This is only just over 8,000,000 voxels I think, the world is 256 x 256 x 128. But the reason I'm showing this one is to do with the procedural generation. 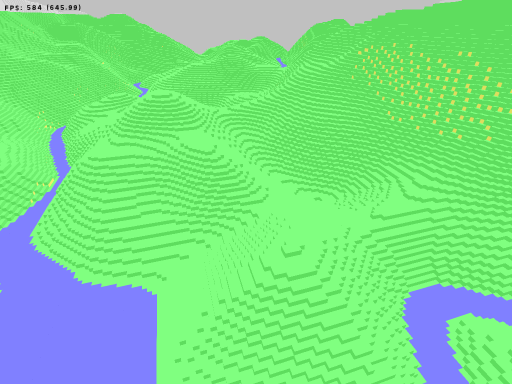 This terrain is made using simplex noise, I've made a few area types, like swapland and mountains. This is more of a river/valleys place, as it produces very nice river-like meanders just from the in-between bit of the positive and negative areas of noise (you make them all positive and you're left with these twisting seams just at position 0, good for rivers!). Later there will be separate passes for features like lakes and canyons. So producing the height is one thing, later on I'll be trying to blend all these different types of terrain together, biome style. Another thing I'd like to mention about this, and it's just something I'm playing with, is the density of dirt in the lower areas. My thinking here was that dirt and sediment would naturally fall down and end up lower, and it's pretty trivial to determine this if you know the max height of your region. And as you can see from the cross-section I think it makes visual sense and looks quite natural. The second bit of the stressy past week was the main GMC Jam. This went a little smoother and I was able to make a game that more closely resembled "finished". I even managed to implement online highscores using Scoreoid. I wan'ted to include more of a story for this game but there wasn't time, though I did get around to setting up a page for it on itch.io so you can check it out there. So last week is all a bit of a blur, I entered two game jams! The first was meant to be a week long "warm up" to the to the main 72 hour GMC Jam. I originally thought that I could just take it easy and do it while still relaxing, I even joined up with someone I hadn't worked with before or even really knew. This someone was another GMC member called HayManMarc. The jam didn't quite work out as I expected it to; Marc and I seemed to work too well together and our game was becoming too good. Relatively speaking of course! :) We didn't manage to perfect the game as well as we envisioned, but hopefully when the Jam smoke clears we can come back to it and give it the attention it deserves. The game itself is basically a clone of an old game called "Choplifter", but with a twist: Zombies. To read more about the game, Marc wrote up a very detailed dev blog here. I haven't set up a page or anything for the game yet, but you can grab the jam submitted build here. So last week I entered a game jam on GameDev.Net. It was a lot of hard work but I'm really happy with the result. I made it with my artist friend, Francis. We had to keep a journal during the process of making our games. Every week I try and do a development video for Terrablox. In this one, I show how far I've gotten so far with dynamic Depth Of Field.